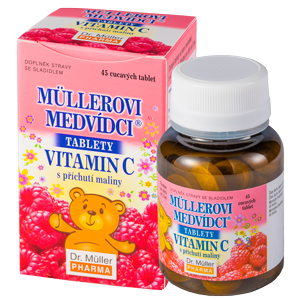 Dr. Müller Bears are available with lemon, tangerine, or black currant flavour. 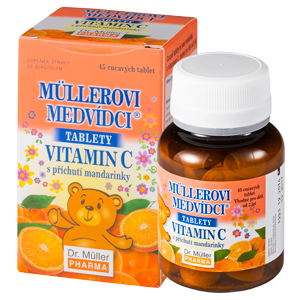 They contain vitamin C. Bear-shaped lozenges are intended for children aged 3 and up. děti od 3 do 6 let 1 tabletu denně, od 7 do 10 let 1 – 2 tablety denně a dospělí a děti od 11 let 1 – 3 tablety denně nechat volně rozpustit v ústech. *Sůl je v potravině obsažena pouze v důsledku přirozeně se vyskytujícího sodíku v L-askorbátu sodném (Vit. C). Bear-shaped lozenges with vitamin C, tangerine flavoured. 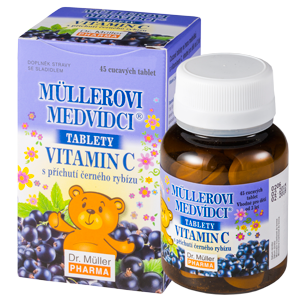 1 tablet daily (children aged 3-6), 1-2 tablets daily (children aged 7-10), 1-3 tablets daily (adults and children aged 11 and up). Let the tablet dissolve freely in the mouth. Bear-shaped lozenges with vitamin C, black currant flavoured. 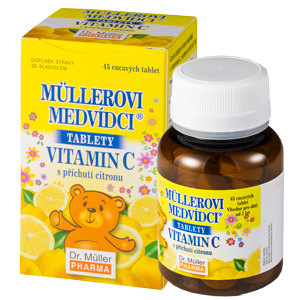 Bear-shaped lozenges with vitamin C, lemon flavoured.